First fully condition an entire block of Blue Pearl polymer clay. Next fully condition 1/4 a block of red, white, and gold clay. Roll your blue clay through the pasta machine on the 3rd largest setting. Cut out 2 star shapes for every 1 star you’d like to make. (i.e. : If you want 3 total stars, you need 6 star shapes). Make a cane border of your choice. I have chosen gold, red, white, and gold clay. I have rolled each color of clay at a different thickness and stacked it on top of each other. Cut the stack in half and combine it and to double the pattern. Cut off the wonky ends. Choose a decorative stamp to decorate the center of your stars. Take the remaining blue clay and roll it on the 4th largest setting. Wrap it around a dowel rod (one of the ones you will be using) and blend out all the seams. BAKE THE CLAY ON THE DOWEL ROD. Bake for 15 minutes at 275 degrees Fahrenheit. Using an stamp ink pad of your choice (I chose gold ink, but you can use whatever you have on hand), add the ink to your stamp and stamp HALF of the stars. Use sandpaper to texturize the remaining stars. Once the dowel rod is done in the oven, gently cut the clay into 3″ sections and remove from rod. Add a drop of Poly Bonder to the end and smooth a ball of clay onto the top to make a cap for one side of the tube. You should now have 3 pieces to your stars: a front decorated star piece, a back textured star, and the piece that will hold the dowel rod in your finished design. Place your decorated star face down on your work surface. Center your dowel rod on the star and adhere with a thin line of Poly Bonder. Place the textured star on top of both pieces. 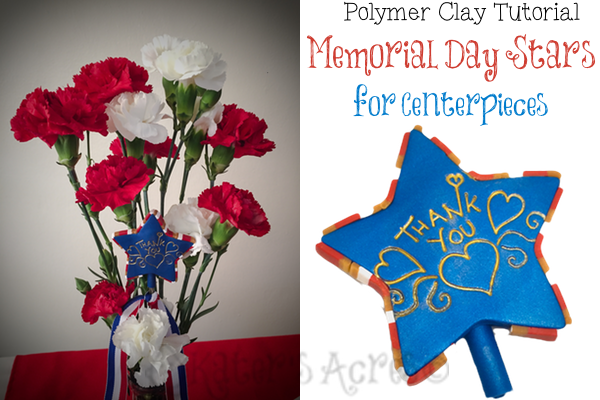 Use the border cane you made at the beginning and cut small strips to trim the outside of your star. Place the strips along the entire rim of your star and press firmly to adhere. Bake your stars face down on a sheet of copy paper for 45 minutes at 275 degrees Fahrenheit. Place on dowel rods and tie a decorative ribbon around the dowel rod if you’d like. Place the star into a matching centerpieces or flower arrangement and enjoy.